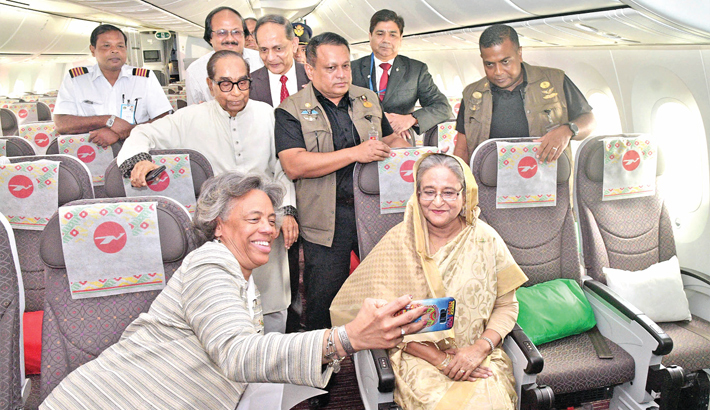 Prime Minister Sheikh Hasina on Wednesday asked Biman Bangladesh Airlines’ employees to work with utmost sincerity for brightening the image of the airlines and as well as the country, reports UNB. “I want every single person in Biman to work with utmost sincerity so that it (Biman) must not have any ‘bad name’,” she said. The Prime Minister said this while inaugurating the operation of newly inducted 787 Dreamliner ‘Akashbeena’ to Biman’s fleet at the VVIP lounge of the airport. In the recent past, she mentioned, some countries imposed sanction on Bangladesh (cargo ban). “One country withdrew its sanction as security at our (airports) has improved,” she said. “Bangladesh has earned the recognition as a role model of development in the world, we’ve to move forward further, upholding the achievement,” she said.